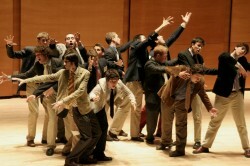 The Rundown: The Beelzebubs are an all male Acappella group from Tufts University in Massachusetts, USA. Beginning in 1962 as “Jumbo’s Disciples: The Beelzebubs”, they dropped the first part and are now commonly referred to as “The Bubs”. The Beelzebubs have recorded 27 albums and three live albums since 1962. Though I do not endorse the shows, The Beelzebubs appeared on The Singoff in 2009 and provide song arrangements and backing-vocals for the TV show Glee. While performing on The Singoff, The Beelzebubs ultimately finished in 2nd place. As far as hipster-trendy-Pop-Star-Producing-Reality-based TV shows go, The Singoff would be the one I hate the least, and only because I like Acappella. Eric Morrissey B’12 President, Michael Grant B’14 Business Manager, Kent McCann B’12 Music Director, Conor Flynn B’12 Historian, Evan Powell B’12, John Kwon B’14, Cailin MacKenzie B’14, Vinny Amaru B’15, Ethan Wise B’15, Tom Lavin B’15, Jason Williams B’15, Jeremy Goldman B’15, Lukas Papenfusscline B’15, and Andrew MacMaster B’15. The Beelzebubs do a pretty awesome rendition of Crazy Train by Ozzy Osbourne, so be sure to check that out. MarsBands.com likes The Beelzebubs because they tend to sing a lot of older, classic songs. Check them out. Acappella …. TWO P’s please. Ack! Color me embarrassed. Consider it fixed. Thanks!